Read the Overview Now Order It ! Positive displacement (PD) flowmeters operate by repeatedly filling and emptying compartments of known volume with the liquid or gas from the flowstream. Flowrate is calculated based on the number of times these compartments are filled and emptied. The main types of PD flowmeters used for gas applications are diaphragm and rotary. These types of meters differ according to the way they trap the liquid into compartments with different shapes. Diaphragm meters have several diaphragms that capture the fluid as it passes through the meter. Differential pressure across the meter causes one diaphragm to expand and one to contract. A rotating crank mechanism helps produce a smooth flow of gas through the meter. This mechanism is connected via gearing to the index, which registers the amount of fluid that passes through the meter. Diaphragm meters are used for gas applications. Rotary flowmeters have one or more rotors that are used to trap the fluid. With each rotation of the rotors, a specific amount of fluid is captured. Flowrate is proportional to the rotational velocity of the rotors. 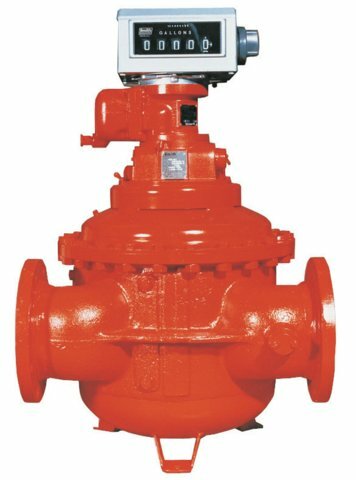 Rotary meters are used for gas applications. Thomas Glover of England invented the first diaphragm meter in 1843. Glover’s meter was made in response to difficulties with liquid sealed drum meters, which were created in the early 1800s. This meter had diaphragms of sheepskin and with sheet metal enclosures. Today diaphragm meters are made from cast aluminum and have diaphragms of synthetic rubber-on-cloth. One major growth factor for positive displacement flowmeters is the large installed base of positive displacement flowmeters worldwide. Because they were introduced more than 100 years before new-technology meters, positive displacement flowmeters have had much more time to penetrate the markets in Europe, North America, and Asia. Installed base is a relevant growth factor because often when ordering flowmeters, especially for replacement purposes, users replace like with like. The investment in a flowmeter technology is more than just the cost of the meter itself. It also includes the time and money invested in training people how to install and use the meter. In addition, some companies stock spare parts or even spare meters for replacement purposes. As a result, when companies consider switching from one flowmeter technology to another, there is more than just the purchase price to consider. The large installed base of positive displacement flowmeters worldwide will continue to be a source of orders for new and replacement meters in the future. Accuracy and reliability continue to be the strongest driving forces behind the flowmeter market. Positive displacement meters are highly accurate because they actually separate the fluid into compartments and count the number of times this is done. There is no need for the inferential method that occurs with meters that correlate flow with velocity, or use the differential pressure method to measure flow. PD meters are widely used for billing applications because they are both accurate and reliable. Both the degree of accuracy and reliability vary with the manufacturer and the type of PD meter. While new-technology flowmeters are making inroads into traditional meters in many areas and applications, this is less true for positive displacement flowmeters for gas applications. Close to 80 percent of revenues from PD meters for gas flow measurement derive from utility applications, where PD meters are highly entrenched (see Figure 1). This includes PD meters for commercial and industrial applications, where utility companies use them to measure the amount of gas consumed by restaurants, office buildings, and other establishments. While there has been a shift from diaphragm to rotary meters PD for these applications, these applications have seen no strong shift away from PD meters. Turbine meters are used for high speed flow utility applications, however. The use of PD diaphragm and rotary meters for gas applications is somewhat like the use of nutating disc and piston PD meters for utility and billing applications in the water industry. PD meters, along with single-jet and multi-jet turbines are still the dominant meter for utility measurement of water flows, especially in residential and smaller commercial applications. However, some new-technology flowmeters such as magnetic and Coriolis are beginning to gain approvals from industry associations for use in utility measurement of water. It is likely, then, that new-technology meters will eventually be used on a more widespread basis for utility gas measurement.